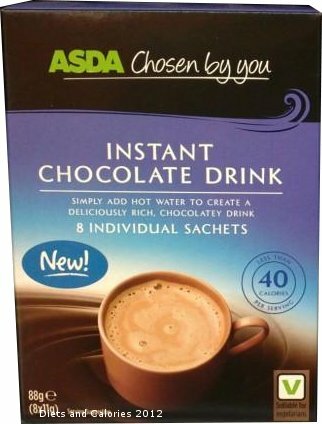 contain eight individual sachets of chocolate powder to which you just add hot water for a deliciously sweet, chocolatey drink. 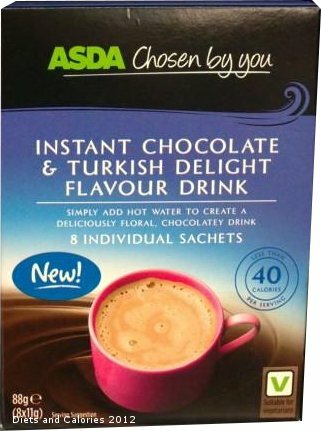 I've been drinking lower calorie, instant hot chocolate drinks on a daily basis for years. 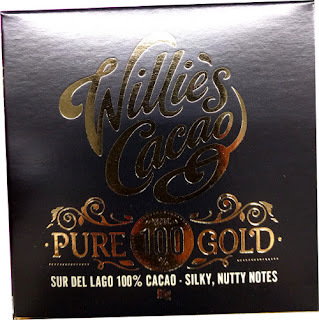 And although I generally stick with one or two favourites, I'm always on the lookout for new varieties and was looking forward to trying one of ASDA's offerings. The smart blue boxes, lined up on the instant drinking chocolate shelves are quite eye catching. And with their 'NEW’ and '40 calories’ symbols, they definitely warranted a closer inspection. 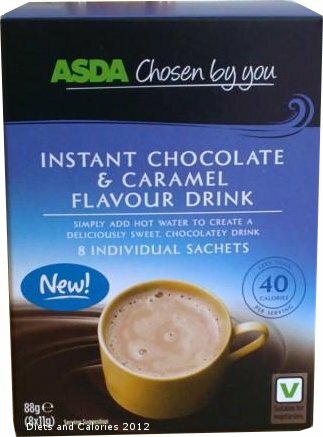 Instant Chocolate & Caramel Flavour – 37 calories. Glancing through the flavours, I opted for the Instant Chocolate & Caramel flavour. Packs are easy to open and the powder mixes well with hot water. I must admit that when I make up my instant hot chocolate drinks, I generally mix the powder with a bit of milk first to make it a bit creamier. On this occasion I simply made the drink up as directed, nothing added. It’s perfectly sweet to drink without any additional sweetener. The caramel flavour gives it a bit of extra sweeteness too. 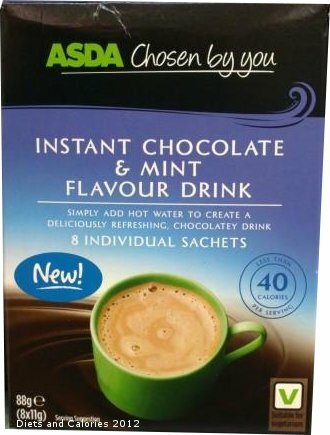 To my tastebuds, which aren't used to the richer flavours of full fat hot chocolate drinks, this mix makes a pleasant and tasty drink. It's ideal if you're trying to lose weight as it's filling and can help stave off the temptation to snack on something higher in calories. 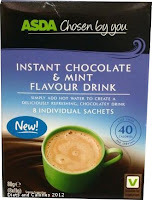 Available in ASDA stores and online. UPDATE: 20 September 2012. 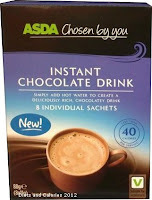 Unfortunately, it seems ASDA have withdrawn this product from their shelves. 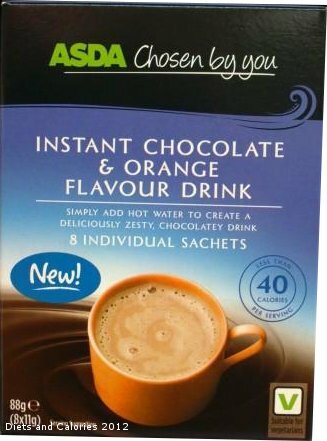 After emailing their customer services department, I was simply told that they were sorry I could no longer find the product, despite it being new and was provided with a link to a selection of other instant hot chocolate mixes. Hmmm, still doesn't provide an explanation as to WHY it's not being sold any more. 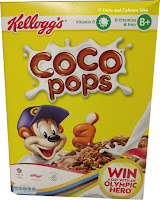 No artificial colours, flavours or hydrogenated fat. Suitable for vegetarians. 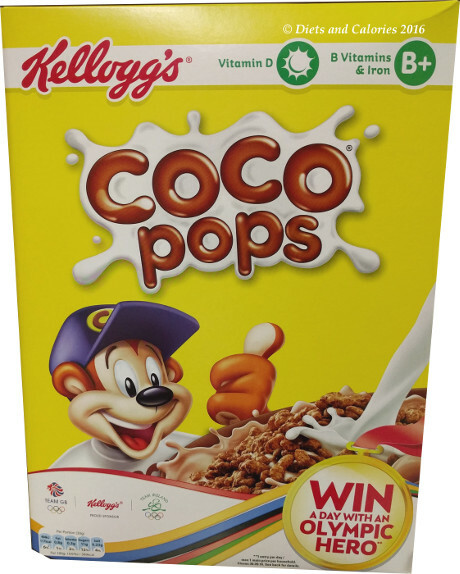 Nutrition Information per sachet Caramel flavour (made up as directed): 37 calories, 1.1g protein, 5.4g carbohydrate, 4.5g sugars, 1.0g fat, 0.7g saturates, 1.0g fibre, 0.4g salt.